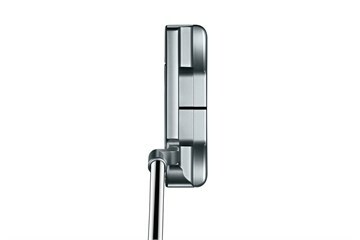 Scotty has refined his Newport model with subtle, yet profound, improvements to the putter's visual and technical characteristics giving players even more confidence over every putt. The three-tiered contours from the topline down the shoulders to the ground cascade effortlessly with nothing for the eye to get caught on. The topline radius has been smoothed ever so slightly to give the topline a thinner, player-preferred look from address. Adjustments to the plumbing neck angle provide an uninterrupted view of the face from heel to toe. And every edge has been sculpted for a soothing appearance, pushing this legendary setup to the next level of aesthetics and performance. FOUR-WAY SOLE BALANCING: The putter's sole milling and draft angles have been re-engineered to account for the weight of the shaft and grip - including neck position and offset - via subtle re-distribution of the sole's balance point from heel-to-toe and face-to-cavity so the putter sits squarely and aligns perfectly at address. IMPROVED SOUND AND FEEL: Up to 30% more vibration dampening material fuses the mid-milled face inlay to the putter body for increased feedback and responsiveness demanded by the game's best players. 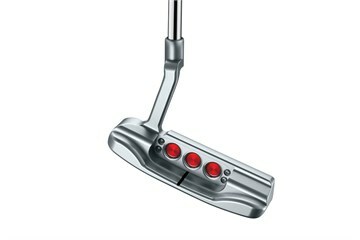 Wow, having been a fan of Ping Anser putters for years this Scotty Cameron is in a different league. 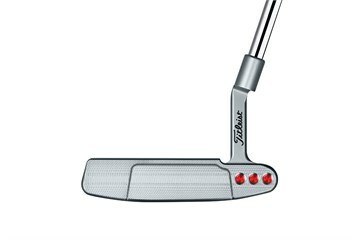 From the contoured feel of the grip to the size of the rounded head and the perfectly balanced and aligned address, this putter really performs. Putts from inside five feet are consistently going in and my stress level reduced. A great buy !